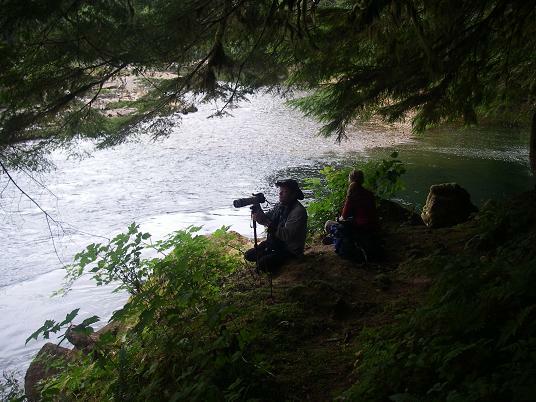 A quiet time on a beautiful river waiting for a grizzly bear to come into view. If you choose the extra day and night at Grizzly Bear Lodge we travel by boat across Knight Inlet through Thompson Sound to the Kakweikan River. The time with Trapper Rick on this BC mainland river is a step into the past and a different lifestyle. Using a former logging roads were branches become the brushes in a car wash, a boat becomes a ferry to cross a river and after a short hike we arrive at Rick’s cabin. Below the cabin and the fish ladder there is a good chance to view grizzlies fishing, or further up the river you can try fishing yourself. Scrolling down to the April 15th you can read about Rick’s trapping demonstration. 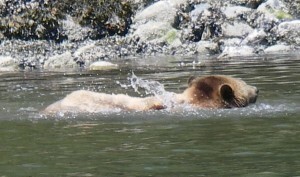 It was a hot day so she was enjoying the swim spending five minutes or more moving up and down the beach. She was not sure of the best way to escape the bear but seemed to enjoy the cooling water….more tomorrow.